A week of sporadic clashes between rival unions and the police that left 10 people dead was followed on Thursday by some of the worst violence post-apartheid South Africa has experienced. A standoff between hundreds of strikers wielding pangas and sticks at London-listed Lonmin's Marikana mine ended when police began firing on a surging crowds leaving many dead. Prior to the shooting the police attempted to disperse the crowd gathered on a hilltop near the mine with water cannons and gas grenades. "The total death of the protesters currently stands at 34 with more than 78 injured," the national police chief Riah Phiyega said in press conference on Friday. A total of 259 people were also arrested and six firearms recovered – some of the weapons belonged to two police officers ambushed and hacked to death by the striking workers. 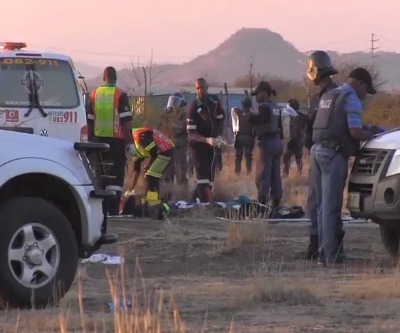 Unconfirmed reports out on Friday on local radio station 702 say another two miners were killed on Friday morning in violence in worker hostels at the mine. President Jaco Zuma cut short a trip to neighbouring Mozambique and will tour the mine. The Marikana mine in the Northwest province of the African nation is responsible for roughly 12% of the world's platinum production. London-based Lonmin has so far lost six days of production or roughly 15,000 platinum ounces. Spot platinum prices jumped by more than $44 an ounce on Thursday and the precious metal was changing hands for $1,460 in early trade on Friday, up another $24. Separately, Lonmin said in an announcement on Thursday that its CEO, Ian Farmer, has been hospitalized after "being diagnosed with a serious illness".